The unique design of the Thai three fold cushion makes it very useful for many different purposes. It can be arranged in different ways, making it a comfortable seat or a mattress to stretch out on. It serves well for reading, watching TV or as a place of rest at the end of a busy day. Our colourful cushions originating from Thailand give a warm living ambience but they are not only perfect to be used indoors but also outdoors, because of the natural materials that are used to make them. Our three fold mattress can keep the floor temperature away and they have special elements to prevent moisture retention, so they can be used in gardens and on patios or balconies. These Thai pillows are also often used by yoga lovers. Due to the versatility and how lightweight the mattresses are you can relax well on them and the triangles are also very helpful for a lot of yoga exercises. Traditionally the mattresses would have been used every day in the family home and social settings like restaurants and cafes. However, three fold pillows are also suitable for use during massage as well; this is because they are hygienic and can be wiped clean after ever use. When they're not needed the mattresses are not taking up a lot of space, still look great and are always ready to be used. Our online shop stands for quality products. All our folding floor cushions are handmade using only sustainable materials are used. All three fold Thai mattresses are handmade using only the highest quality materials. Thai Pillow keep up with the traditional method of producing these cushions, this includes using the same or equivalent natural materials. The stuffing of the three fold mattresses is made up of a naturally sourced Kapok fibre; this is lightly coated in a natural wax which prevents the moisture build up. Kapok is also hypoallergenic making it suitable for the entire family. Our Thai folding mattresses are structured using an age-old method of stacking smaller triangular tubes on top of each other and next to one another to create a sturdy and robust support. This allows the cushion to be utilised as a seat, a lounger and laid out fully as a bed. You can invite guests over to stay for the weekend without having to worry about offering them and uncomfortable blow up mattress to sleep on. Thai pillows are the ultimate piece of furniture for any home as they can be used by adults and children alike. 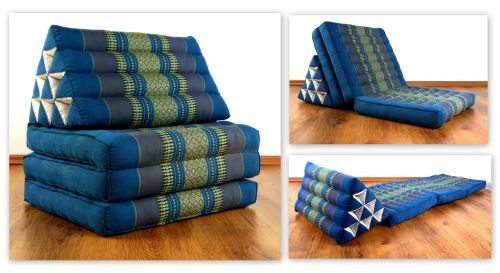 If you have any questions or queries about our three fold Thai floor cushions, please to do not hesitate to contact us and we will get back to you as soon as possible.